You are currently browsing the tag archive for the ‘Gordon Lightfoot’ tag. All of the ingredients to create the perfect storm of jazz and blues are mustering up, right now. In a matter of days, the Wreckhouse International Jazz and Blues Festival will rev up and get started. This year promises to be one of the best yet, as Wreckhouse Jazz and Blues seeks to get settled after launching its new brand just last year. While the look is shiny and new having only been unveiled immediately before the 2008 festival, this year is actually the eighth annual event since the original Hew Knoo Jazz Festival as it was once known. The calibre of festival has ostensibly grown and now the truly international flavour is being fully embraced for the first time by including it in the festival’s name. This year’s line up of 150 artists packed into 40 concerts over a six day period from July 14th – 19th is reflective of impeccable taste and variety. If anything is for certain, there’s plenty to celebrate at this year’s festival which kicks off July 14th with a Latin inspired evening at the Martini Bar featuring Salsa Roca, Bill Brennan and Banda Brazil. Multiple Juno nominee’s Cadence, not to be missed on day two, are a four-man group who need nothing more then a vocal warm up and a microphone. They’ve performed alongside greats such as Gordon Lightfoot and Quincy Jones and as part of Wreckhouse, they’re also offering a workshop on stage presence before their show in the afternoon! Also on July 15th at the D. F. Cook Recital Hall, The Bad Plus will be performing tracks off their most recent release, For All I Care which mixes up highly familiar rock and pop pieces with classical songs all on the same album. The thought behind the somewhat concept album was that all music can share the same space and be appreciated. Unlike the group’s initial release, Prog, the latest offering is the first time The Bad Plus has welcomed a guest vocalist. Getting right to business with a great schedule highlight for the whole family, Kelly-Ann Evans, Janet Cull and Dana Parsons will be paying tribute to Motown’s 50th anniversary on July 16th at Holy Heart Theatre. The local ladies of soul will honour the work of women including Aretha Franklin, Roberta Flack and The Supremes. 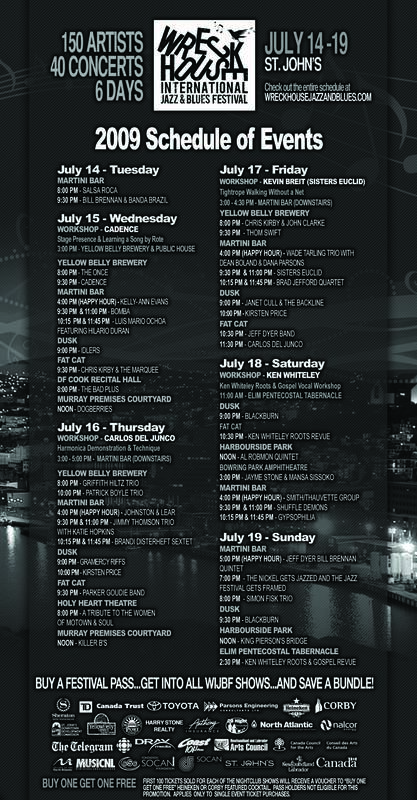 Wreckhouse Schedule of Events - click to enlarge! After the kids have gone to bed, Dusk will feature Kirsten Price later that same night with Gramercy Riffs opening and again the next with Janet Cull & the Backline. Billboard magazine claims Price “should offer triple A radio a new star,” and people are likely to have heard her soulful voice before her solo album Guts and Garbage in commercials for Coke, Clinique and Campbell’s. Her tracks have also been featured in shows such as The L Word, CSI and ABC’s Cashmere Mafia. Saturday, Halifax-based Gypsophilia perform at the Martini Bar as well as The Shuffle Demons who include three saxophonists, a dancing drummer and an upright bass player. Celebrating a quarter century together, The Shuffle Demons are known for a wacky wardrobe and a no holds barred approach to performance which often has them playing right in the middle of their audience. Gypsophilia is also not a small group, featuring seven young talents who released their ECMA nominated debut album in 2007 called Minor Hope. They’re now following that up with Sa-Ba-Da-OW! They’ve been promoting the record since its June 19th release on a national tour that makes a stop at the Wreckhouse International Jazz and Blues Festival. For a taste of Gospel, another of the four workshops being offered this year will take place Saturday July 18th, hosted by Ken Whiteley – one of Canada’s most respected Roots musicians. A performer since the 1960’s with the Original Sloth Band, Whiteley’s even taken to the Saturday Night Live stage with Leon Redbone. Those that attend the vocal workshop in the morning will also have a shot at performing themselves when Whiteley does a Roots and Gospel Revue at the Elim Pentecostal Tabernacle the following afternoon on Sunday. The festival will be non-stop right up to the final highlights lined up for the night of Sunday July 19th that include the beloved Nickel Gets Jazzed and Wreckhouse Gets Framed at the Martini Bar. The event features silent films shot on old school film during the Nickel which are screened for the first time, accompanied by a jazz musician. Just up the street at Dusk, Blackburn will be the grand finale to an extremely jam packed six days! Wreckhouse Jazz and Blues has made it incredibly easy to get involved with these events; complete schedules, workshop information and tickets are available through their newly redesigned website, www.wreckhousejazzandblues.com. They’ve also included a Festival Pass option for the die-hard jazz and blues lovers at an amazing value of $140.00. Wreckhouse Jazz and Blues has also set up some free events throughout the festival week geared towards families and the outdoors. The Murray Premises Courtyard and Harbourside Park will play host to a lunchtime concert series and on Saturday July 19th Jayme Stone and Mansa Sissoko perform at the Bowring Park Amphitheatre, perfect for a picnic!